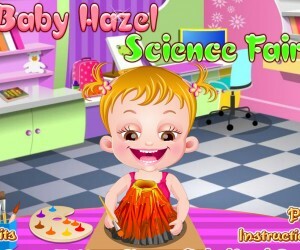 Baby Hazel wants to plant and grow a garden. Players will assist with gardening clothing, accessories and tools. Help with digging, planting, and watering. 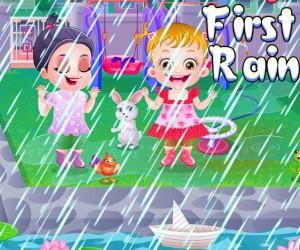 Win the game simply by facilitating a garden adventure for the sweet little girl and completing each of the four levels. First, players will identify appropriate protective gardening clothes and gear. Hints are given in the middle of the screen for correct choices. After the clothing and accessories have been chosen, the basic needs of plants must be identified. Pictures for water, air, sun and soil must be matched. Finally, gardening implements and supplies must be chosen for planting and growing roses. The next level requires getting the garden plot ready for planting. Thought bubbles appear in the air with picture hints for the next tool needed. Help to rake the soil, but be ready to soothe with a rattle if a worm makes a surprise appearance. Seeds will need to be planted, covered and watered by a watering can. While waiting for the plants to grow, help to get a lollipop and take a break. Once the roses bloom, attention should go to help with the vegetable garden. Bugs need to be sprayed, plucked from the plants and placed into a jar. Next, help to water the garden with the hose. Lastly, harvest the tomatoes, eggplants and roses into buckets. Players will use the cursor to drag and drop items in order to review which tools are used. They will place each implement into the correct space. Players should select and put things in the right order to demonstrate knowledge of planting sequence. Baby Hazel wants to make a gift basket for Mommy. Items will need to be handed from the crop to place into a basket. Eggplants, tomatoes and roses all go into the basket. Follow the hints in the thought bubbles while paying attention to the darling girl’s mood. A bottle of milk or a cuddle from a teddy bear may be needed to keep the happiness meter full. A sweet note is placed on top, and the game is complete. It is time to teach Baby Hazel how to grow a rose plant. Baby Hazel has a garden in the backyard and she wants to grow different flowers and vegetables there. Teach Baby Hazel all about gardening and plant a rose with her. First help her identify the terms related to gardening. It is all about the required costumes, accessories, tools and supplies. Then dig soil and plant a rose. Also teach Baby Hazel to do an insect treatment. Finally make a surprise boutique for her Mom.